The time for online voting is now, which can be done privately and securely, the Follow My Vote way. The Follow My Vote online voting platform uses elliptic curve cryptography to secure its operations. For more information on cryptography and how we use it, please visit our page on Elliptic Curve Cryptography & Securing Online Voting. 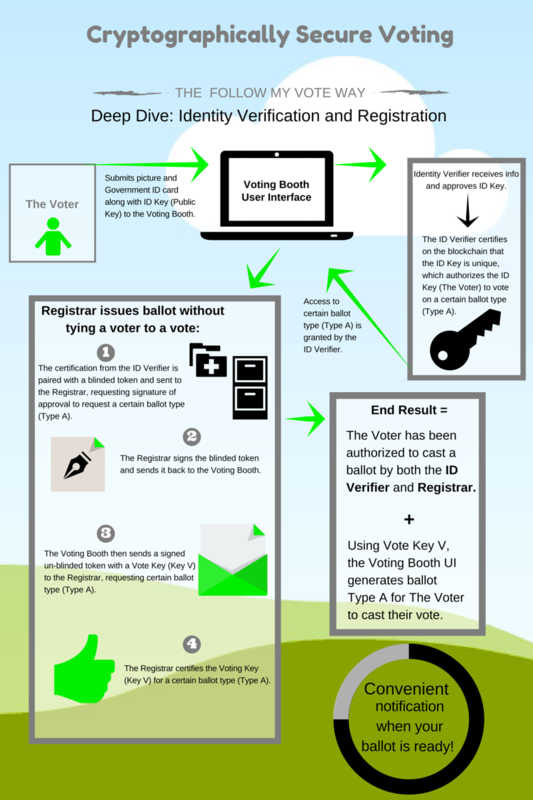 To help further explain, we’ve created this infographic to explain how the system operates using a cryptographically secure voting process to ensure that each voter is issued the correct ballot without their identity being tied to their vote(s). To summarize the above infographic, in Follow My Vote’s online open-source voting system, a voter must have their identity verified by an Identity Verifier and be issued a ballot by the Registrar. The Identity Verifier reviews the voter’s personal information, certifies that the voter’s identity hasn’t already been registered within the system, determines which ballot type the voter is supposed to receive, and ensures that the voter is only authorized to request one ballot in each election. The Registrars are responsible for preparing the ballot types and ensuring that each voter is issued the correct ballot type. The beauty of our online voting system’s design is that the Identity Verifier will never know how each voter has voted on their ballot; and, the Registrar will never know the identity of the voter they issue the ballot to, which ensures that each voter’s right to privacy is protected when casting their ballot. To learn more about how our voting system works as a whole, please visit our page on Blockchain Voting: The End To End Process. Is there a charge to vote via the Bitshares blockchain? If so, what would the charge be? i have requirement for voteing soluation software, please send me more details and cost. Kndloewge wants to be free, just like these articles!